Yet another way to create the traditional orange peel pattern. 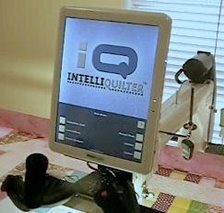 the first n method is demonstrated at intelliquilter.com (look for demos and tutorials in the side menu) The second method is demonstrated in another video. This third method was shown to me by Zoltan. This video was filmed by Kathryn Fuller during a class at her home. You will hear other attendees comments. Helen demonstrates one way to set up the orange peel pattern in a block. There are other ways to do this. Helen demonstrates setting up a border pattern that has corner designs.